Each year Martha Arterburn, County Extension Agent for 4-H Youth Development, and I put our thinking caps on and "design" a basket for a 4-H Basket Workshop here in Allen County, Kentucky. This year Martha was gifted with several boxes of reed from two generous local basket weavers and those sizes of material and donated handles were our inspiration. 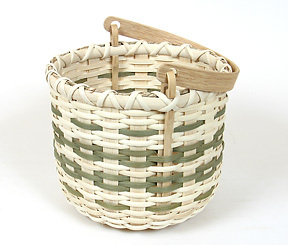 The County Fair Basket has a wooden base, handcrafted oak Swing Handle and 5/8" stakes; it's woven with 1/4" natural and dyed flat and flat oval. An easy and fun basket — just a great little weaving project! Calculate Supplies for 1 to 20 County Fair baskets with the Basket Supply Calculator. The Supply List gives you the least expensive way to purchase the supplies for your quantity of baskets. View on-line or print to your printer.